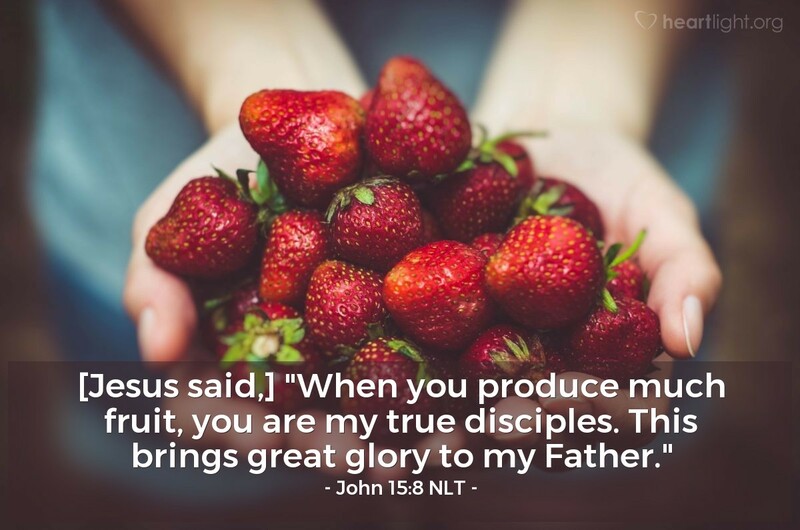 [Jesus said,] "When you produce much fruit, you are my true disciples. This brings great glory to my Father." True disciples become like their teacher, Jesus! (Luke 6:40) That means their lives are fruitful. They take on the character of Jesus (Galatians 5:22-23). They also care for people as Jesus does by living sacrificially and redemptively (Philippians 2:5-11). Their Christianity isn't all talk, but it is demonstrated in both word and deed (1 John 3:18). They let the fruit of their lives bring glory to God through the things they do and the way they live their lives (Matthew 5:16). Holy and righteous God, my heavenly Father, please fashion me into a true disciple — one of your children who brings you glory because of the quality of my character and because of my commitment to bring others to know your grace. Help me to live like Jesus. In Jesus' name, I pray. Amen.